With beverage companies becoming much more aware of their ‘carbon’ footprint, and in a race to be the ‘most green’ many companies are in a hurry to green up their bottles. 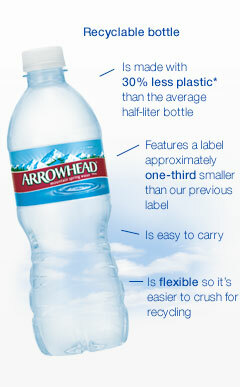 While Arrowhead Spring water has had the claim that they have the ‘greenest’ water bottle among bottled water companies with their Ecoshape bottles, the soda companies are now getting in on the action. Coca-Cola recently introduced their new PlantBottle and detail their steps toward a more sustainable bottle. This new PlantBottle is produced using a blend of petroleum-based materials and up to 30 percent plant-based materials. Coca-Cola is using sugar cane and molasses, a by-product of sugar production, to turn into a key component for PET plastic in the PlantBottle. This allows the bottles to be fully recycled without contaminating the traditional PET plastic recycling process, and reduces carbon emissions by up to 25 percent, compared with petroleum-based PET. Arrowhead Ecoshapes bottles are noticeably much thinner than most and claim that they are easier to recycle, but does that all of a sudden make them eco-friendly? These solutions are a step in the right direction environmentally, however, I would argue that we need to shift our mindset. Essentially, we are just impacting the environment less, but are still responsible (maybe just a little less so) for one of the most destructive waste products on the planet. Petroleum based plastic is responsible for the deaths of millions of sea creatures a year and has created a plastic garbage island twice the size of Texas in the middle of the Pacific Ocean. I can see their attempt to ‘green’ their bottles as a way to remain in a very profitable, and very convenient disposable packaging industry, but alas their business model is far from environmentally friendly. In a world (at least where these bottled waters are marketed) where you can just turn a knob and get high quality drinking water just about anywhere, and with the abundance of re-usable durable water containers in all shapes, styles and materials – these bottles should be obsolete. The fact that they are not is due to convenience, and for bottled water, a widely held belief that therein contains a higher quality water or exotic product. Tap water is monitored very carefully for pesticides, heavy metals, chemicals and organic materials with strict thresholds for each while bottled water is self regulated. This is not to say bottled water is dangerous, but studies have proven, time and time again, that the tap water in many cities is higher quality (less contaminants and higher mineral content) than those in the bottles from glaciers, springs, aquifers or mystery locations. It is not a secret many bottled water brands even bottle that very same tap water, however, this information doesn’t seem to play in the minds of consumers. As a product, bottled water has no real advantage over the plentiful and also convenient (with re-usable bottles) tap water. Product aside, the real issue here is the proliferation of disposable packaging. Our solution to this is to recycle, however, recycling is highly overrated and should be a step towards a better solution, not THE solution. You are programmed to think recycling solves our over-packaged and ‘bottled for your convenience’ society. Everybody feels good when they recycle. You feel like you are doing your part to help the planet, be green, save the earth and all, but this is a half-truth. Recycling is an energy intensive process that uses resources, pollutes and tends to produce a lower grade product in the end especially in the case of plastic recycling. Recycling should be the last resort of the 3Rs- Reduce, Reuse, Recycle. I propose we do away with plastic bottles, much as we are attempting to do away with plastic shopping bags. They are unnecessary and have become a modern day convenience turned hindrance. We should take the so called ‘third-world solution’, and return to the pre-disposable days of re-use and ingenuity in packaging. I challenge you- go out and purchase a reusable bottle of your choice (here is a nice selection to choose from ) and substitute it for your bottled water, your bottled soda (find a 7-eleven or a store with a soda fountain for your bubbly refills), even your daily iced-mocha. If you keep track of all of the plastic bottles and disposable plastic cups you have kept out of landfills, ocean islands and recycling plants, it will shock you. Plus I bet you will actually like it. 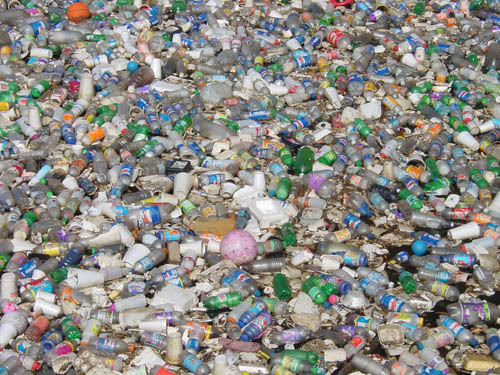 Bottles made of PET which photodegrade or disintegrate to smaller particles will sink to the ocean floor and not float forever since the density of PET is 30% greater than that of water. 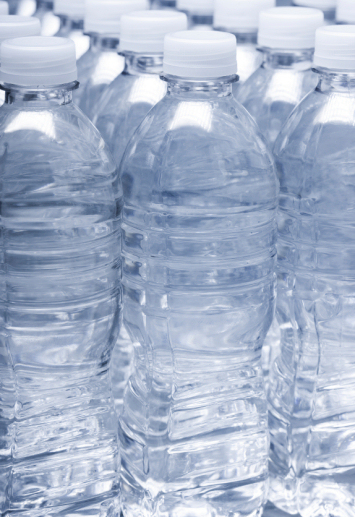 Most of the energy that is needed to make the PET bottle is contained in the bottle and very little (1/10th) of it is required to re-make the bottle (called sensible heat vs. the latent heat already contained in the bottle). Therefore recycling is not energy intensive. Recycled PET does not go into lower grade products but into high quality manufactured goods including new bottles. If folks would recycle every bottle purchased then the need for new raw materials would go down substantially and reduce energy useage and waste. You do a disservice by dissing recycling! I appreciate the feedback, but I believe you misinterpret my argument. While PET specifically may not contribute to ‘garbage island’ once partially degraded, it still does horrendous damage to the seafloor and the organisms living there. Where recycling PET itself may not be very energy intensive, the process itself is- collection, transport and cleaning before recycling even takes place contributes significantly to the overall carbon footprint of the process. While PET can be made into high quality products, most new bottles have less than 3% recycled PET, if any at all. The majority of PET is melted and drawn out into long fibers and recycled into carpets, fiberfill for jackets, and fabric for T-shirts and shopping bags which unfortunately cannot be recycled and thus enter the waste stream. While I agree with you 100% that recycling is very important and reduces the production of new raw materials, the argument I state in the article is that these bottles aren’t even necessary. The real focus should be on promoting reusable containers and elimination of such a disposable society. It really is quite simple and straightforward, but I believe we must shift our thinking (about disposable items and recycling in general) first. my family and frieds and I have been drinking water from the tap our entire life. when we travel we bottle water from our tap in our reusable water bottles, so we dont have to buy bottled plastic water. we are shame for the platic bottle garbage that we se all over our streets and along our water edge in our state. it’s a sure thing that most people are not do their part in recycling the bottles. I practice what I preach, to my co workers and at times the general public. I would like to do more, so what else can I do.